At the divisional level, you may also receive communications relevant to your specific division or building. RDM produces a Funding Opportunities Bulletin which provides information on internal and some external funding opportunities. The bulletin is where we disseminate information about RDM internal deadlines. All seminars and events taking place in RDM appear on the website. To keep up to date with events, seminars, talks and workshops taking place across the Medical Sciences Division, sign up to receive a weekly digest of all events. The digest is sent out via email every Friday, listing the events for the following week. To receive the digest, please email msd_events-subscribe@maillist.ox.ac.uk (Subject: Subscribe). 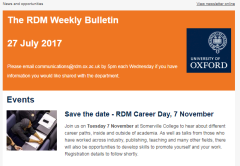 You can view the OCDEM Weekly Bulletin online here. Read the biannual OCDEMension Newsletter online here. Please fill in this form to let us know about Public Engagement activities that you have participated in.